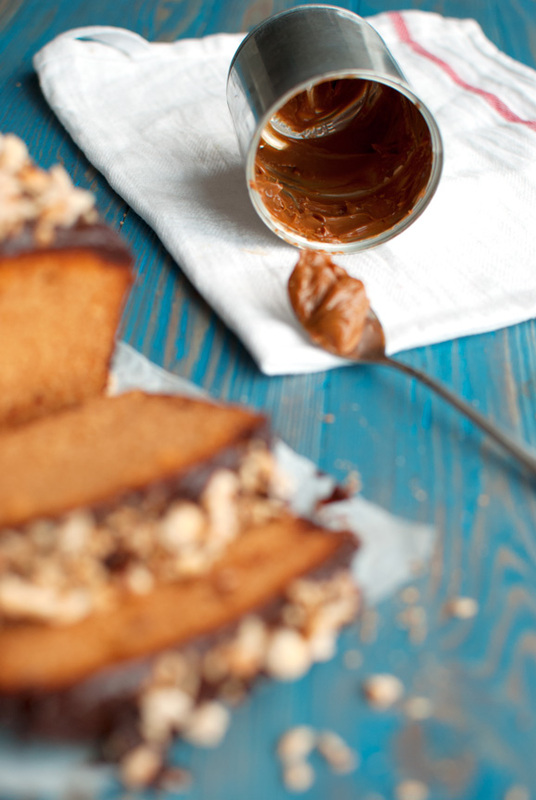 If you think dulce de leche is good, then just wait until you try this cake. It’s scrumptious. 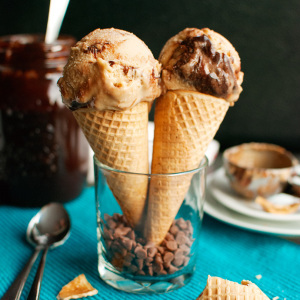 And a fun way to use dulce de leche, too. Which is exactly what I had in mind when I first thought about doing a series on the different ways of making dulce de leche. A week? Sure, I can finish two cans in one week. But why would I, if I can use it to make desserts, cookies, brownies and cake? Cake that is just absolutely to die for! I made it with brown sugar (yum), salted butter (yum yum) and almost an entire can of dulce de leche (yum yum yum). 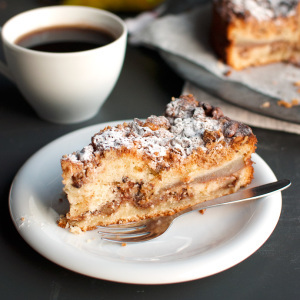 Consequently, this dulce de leche cake is just spectacular. In fact, the Rocking Rebel has a new addiction: plain dulce de leche cupcakes. I made him a batch on Monday and then another on Tuesday and he has gotten in the habit of bringing a few of those little cupcakes to work with him every day. I just love it when big, tough guys like the Rocking Rebel go nuts over cupcakes! It’s like a shark preferring sushi over a big, fat seal or a lion choosing filet mignon over a fresh, juicy zebra! 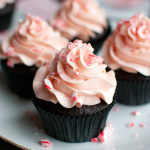 Personally, I also love the little plain cupcakes – and if you don’t feel like making ganache by all means serve the cake plain because it’s ridiculously good – but isn’t everything just a little better when it’s covered in chocolate? That’s what I thought as I poured a bowl of dark chocolate ganache on top of the cake and then sprinkled it with some chopped, toasted hazelnuts. By the way, how is it that messy food looks so good in photo’s? It’s always a hassle to photograph something with ganache or caramel on it, because some of it always ends up in your hair, on your hands and on your camera. And on your forehead, which I noticed right after I took Lucy for a walk. Aaaanyway, this photo just makes me want to run to the kitchen and get myself a big slice of leftover cake! I mean, just look at that crumb! 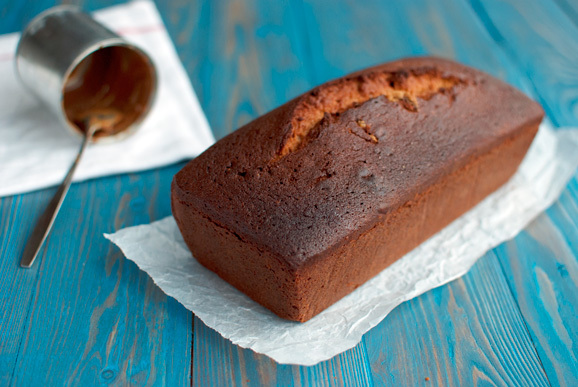 If I had to describe this dulce de leche cake with just one word, I would say: fluffy. Well, actually I would probably go for ‘delicious’ or ‘insanely good’ (which are actually two words), but this cake sure is fluffy, delicate and light. With a gorgeous caramel color too! And the best thing about this recipe? You will have some leftover dulce de leche. Not enough to serve on toast or make another cake with, but just enough to enjoy straight out of the can! Preheat your oven to 160°/320°F (standard oven setting) and line a 26x8x7cm (or a 10x3x3-inch) loaf pan with baking parchment. 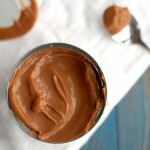 To the bowl of a double boiler, add the dulce de leche. Heat gently, stirring with a spoon, until the dulce the leche becomes somewhat runny. Set aside to cool slightly. In a large bowl, mix together the sugar and butter for about 2 minutes, or until light and fluffy. Add the eggs one at a time, allowing each to completely mix in before adding the next egg. Use a rubber spatula to scrape the sides of the bowl if needed. Once all the eggs have been added, mix in the dulce de leche and the vanilla. Again, use a rubber spatula to scrape the sides of the bowl if needed. Finally, fold in the flour and the baking powder with a rubber spatula. Once the flour has been absorbed by the wet ingredients, mix the batter for 2 minutes. Pour the batter into the prepared loaf pan and bake for 30 minutes, then cover loosely with aluminum foil and bake for another 30 minutes, or until a tester inserted in the center of the cake comes out clean. 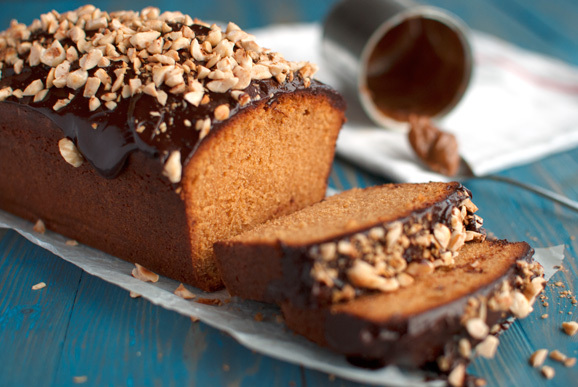 Leave the cake to cool for 20 minutes in the pan, then take it out of the pan and leave to cool on a wire rack until cool. Once the cake has cooled sufficiently, proceed with the topping. Heat a frying pan over medium-high heat until hot. Add the chopped hazelnuts to the dry pan and toast for about 5 minutes. Make sure to shake the pan every 30 seconds or so to ensure that the nuts brown evenly. Transfer the hot nuts to a plate and leave to cool. In the meantime, combine the whipping cream and the sugar in a small saucepan. Heat over low heat, stirring to dissolve the sugar, then crank up the heat and allow to reach scalding point. In the meantime, ad the chopped chocolate to a heatproof bowl. Once the cream mixture reaches scalding point, pour it over the chocolate. Use a spoon to submerge the chocolate into the hot mixture. Leave to stand for 5 minutes, then stir until smooth. 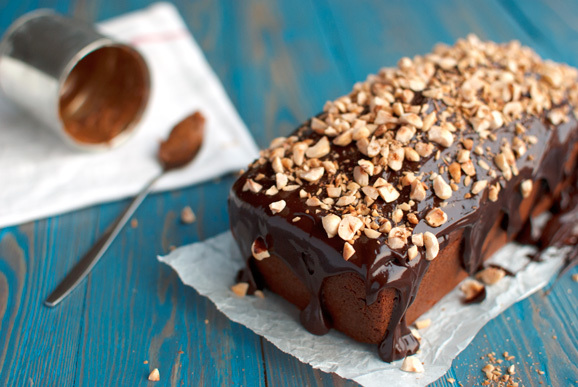 Pour the ganache over the cake and sprinkle over the nuts. 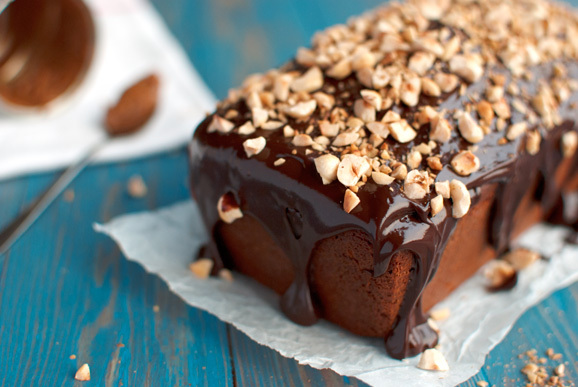 Serve immediately or allow the ganache to set before serving. Enjoy! That looks decadent and delicious. Pinning! anyway, a question for this cake: Can it be served over night? 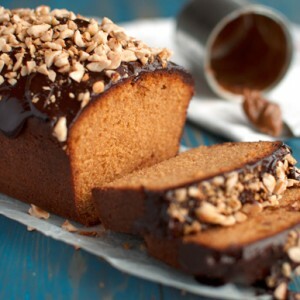 Planning to make it for my bf’s birthday and to bring to the office the next day.. will it still taste good overnight? Yes I read Rocking Rebel’s post on the 14th! Thanks for your reply.. think i’ll miss the other cake and make this one instead.. I’ll leave the other cake for next time. hehehe.. will let you know how it turns out this weekend!!!! Is there anyway I can make a denser, fudgier version of this? Would I have to change the ingredients ratios or just take it out of the oven a little before ? Hi Chiara, it took me a while to find the answer to your question and I’m still not really sure I can help you with this. However, what I know from brownies is that they get fudgier and denser if you decrease the amount of flour in the batter, so you could try that! Just keep in mind to also decrease the amount of baking powder, or leave the baking powder out completely; the lack of a leavening agent will also make the cake denser. and made three 8″ layers? Looks delicious. I’m going to try it either way. I was googling for dulce de leches cake recipes and stumbled upon your blog. I have to say that cake looks amazing!! I just wanted to ask how sweet is it? I would like to make this for my family but they don’t really like cakes that are too sweet. Let me know! Thanks! 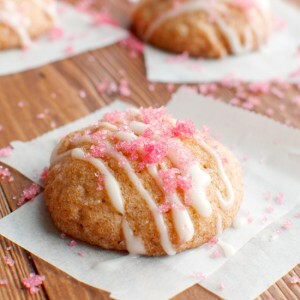 I have just found this recipe and it looks delicious! I just wondered what amounts (and cooking time) you would suggest for a bundt tin? Planning to try this cake for a coffee meet at my husband’s office. Could you please let me know the time it would take to cook if i were to pour the batter in a 9 inch cake pan? Hi Priya, I’m not sure how log it would take to cook in a 9-inch pan, to be honest. Just look for the signs of doneness: it should be golden brown on top and if you poke the center of the cake with a toothpick, it should come out clean!